For today's card, I wanted to challenge myself to use zero patterned paper while still creating a dynamic card. Not an easy feat since I love my paper a lot. I'm a huge fangirl of pretty paper. So I knew this one would be a tad tougher. So, I've found a way to remedy this situation, and that is by making my own paper! By selecting a base paper, and a few ink colors, watercolors, or markers, I can make sure that all the itty bitty pieces match perfectly and that the colors are consistent. And I love that I don't have to compromise on style! TIP: When I'm not in the mood to make cards, I sometimes just doodle with my watercolors inside my paper pad, and then save the sheets for a later project. This way, I have perfectly coordinated doodles and patterns to use when I'm short on time. 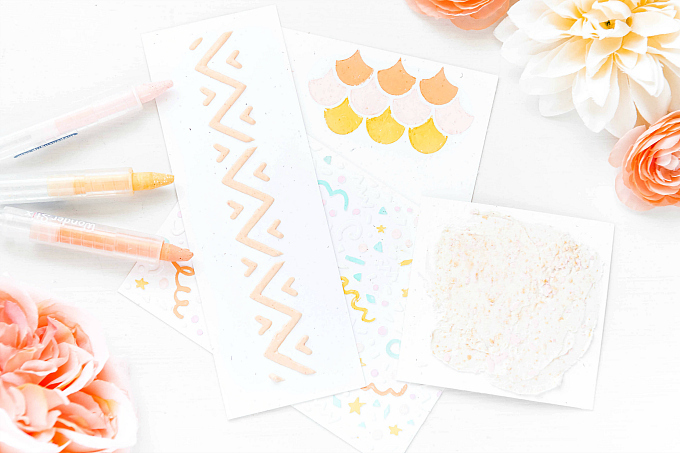 To make the above pattern, I used the widest of my water brushes to make bold strokes on my watercolor paper, in two different colors of yellow (Mustard Seed + Fossilized Amber), along with a soft pink shade (a blend of Spun Sugar and Picked Raspberry). I decided I liked the messy painted look, and that this was going to be my main paper. To make coordinating colored paper, I then squeezed my waterbrush, releasing more water and diluting the pink color, to paint a piece of watercolor paper in a soft pink shade that I would later use for die-cutting. Lastly, I painted another piece of watercolor paper with the yellow tone, and yet another piece of paper in a bright pink tone (using Picked Raspberry). I set all the papers aside to dry before die-cutting them. Once dry, I used the different colors of paper to die-cut three medium sized stars and two large stars, using PTI's Seeing Stars die collection. At the top of the card, I added a little bit of washi tape. Just below, I added another piece of cardstock that I had stamped with a chevron background stamp with Viridian Archival ink. If you don't have a chevron stamp, a die such as this one or this lovely one would do the trick too. Just atop that, I added an embossed sentiment, using PTI's Wonderful Words: Baby stamps with Ranger Super Fine Detail white embossing powder. I used some older star stamps and some yellow ink to stamp a star pattern on a carstock base, and then used the Confetti Garlands die from PTI to cut out a sweet circle border. I added some leaves to the stars, stamped and cut using Rosie Posie stamps and dies, as well as a few other older stamps. Just below that, I added a pom-pom trim, and two layered stars to the side. I used PTI's Monthly Moments: Journal Card #2 to cut a scalloped design out of my paint stroke pattern, and added a bit of the darker pink paper underneath, so that it would poke out under the scalloped bits. At the bottom, I added another layered star, with a sentiment stamped on top. I used the Monthly Moments: Journal Card #5 die to die-cut an adorable pattern of small stars onto the larger white star. 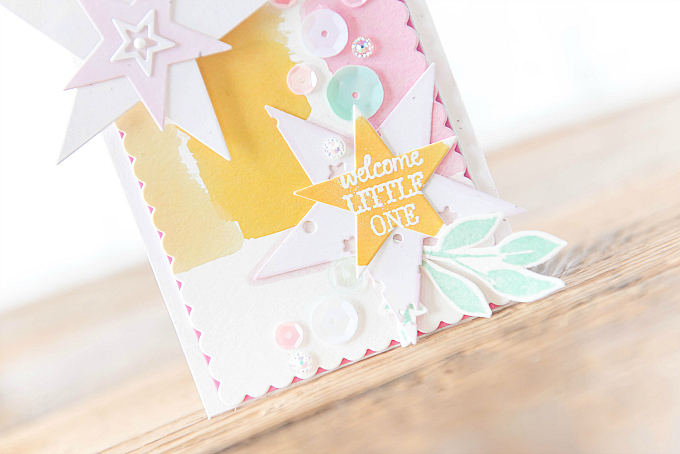 You'll also notice a very fine and soft pink border around the white star at the bottom. It's just a tad of shading with a Copic marker for a little extra dimension. Lastly, I sprinkled on a mix of aqua, white, clear and pink sequins, along with a few of my favorite iridescent gems. Thanks for joining me today! Hope you're having a wonderful hump-day! 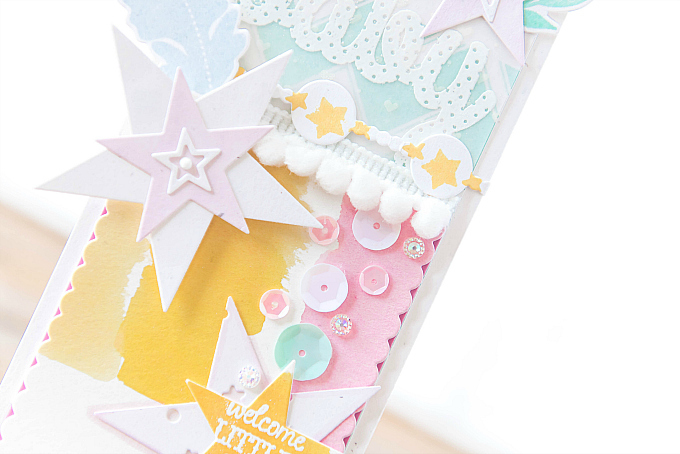 So many sweet elements layered together perfectly for the new little bundle! Lisa, thank you SO much for always leaving sweet notes here for me :) I cannot tell you how much I appreciate your kindness. You always make me smile! Hugs dear friend! You really know how to make it ALL work together, Ivana! How absolutely incredible! What an incredibly kind note, Michelle! Thank you so much - means a lot to me coming from you! Sending big hugs! Your handmade patterned paper totally rocks!! All those lovely elements layered together look so beautiful. Aw thanks so much, sweet Nora!! So incredibly kind of you :) Sending you big hugs! Thank you so, so much!! Sending you big hugs! So beutiful and sweet, love it .So proud of you,love mom!